Married Name 1907 As of 1907,her married name was Volmer. Martha K. Pratsch was born circa 1889 at South Dakota. She married Herman H. Volmer Jr., son of Herman Volmer Sr. and Mary A. Hilgenhold, in 1907. Married Name 18 February 1909 As of 18 February 1909,her married name was Torgerson. Mary Volmer was born on 21 December 1885 at Minnesota. She was the daughter of Herman Volmer Sr. and Mary A. Hilgenhold. Mary Volmer married Oscar Torgerson, son of Tov Torgerson and Anna (? ), on 18 February 1909. Mary Volmer died on 22 May 1972 at age 86. John H. Volmer was born on 25 September 1888 at near Yankton, South Dakota, also reported as Sep 1887. John H. Volmer married Annie C. (?) circa 1914. John H. Volmer died on 17 April 1959 at age 70. [S250] U.S. Federal Census 1930 U.S. Federal Census, by Ancestry.com, ED38-5. Dwelling 10. George H. Volmer was born on 11 September 1884 at Tell City, Perry, Indiana. George H. Volmer married Josephine Mary Cook on 23 January 1910 at Montrose, Missouri. George H. Volmer died on 5 August 1975 at New Underwood, Pennington, South Dakota, at age 90. [S250] U.S. Federal Census 1930 U.S. Federal Census, by Ancestry.com, ED52-41. Dwelling 3. Name Variation Anna Volmer was also known as Annie. Anna Volmer was born on 20 May 1893 at Missouri also reported as Nov 1891. Anna Volmer died on 18 December 1928 at Draper, Jones, South Dakota, at age 35. Joseph M. Volmer was born on 4 July 1895 at Germantown, Henry, Missouri. Joseph M. Volmer married Mary A. Beckebrock on 7 August 1917 at Montrose, Missouri. Joseph M. Volmer died on 22 March 1970 at Montrose, Missouri, at age 74. Name Variation Mary A. Beckebrock was also known as Bekebrock. Married Name 7 August 1917 As of 7 August 1917,her married name was Volmer. Mary A. Beckebrock was born on 18 November 1894 at Illinois. She married Joseph M. Volmer, son of Herman Volmer Sr. and Mary A. Hilgenhold, on 7 August 1917 at Montrose, Missouri. Mary A. Beckebrock died on 4 April 1962 at age 67. Bernard Volmer married Francesco Freidler. Married Name Her married name was Volmer. Francesco Freidler married Bernard Volmer. Name Variation William H. Hard was also known as W. H.
He married Ellen (?) circa 1894 at first wife for him. William H. Hard married Harriet Jane Crotchett, daughter of Thomas Crotchett and Martha Susan Tanner, on 28 April 1912 at Lemoore, Kings, California. William H. Hard obtained US Social Security Card; according to the California Death Index. He was a harness maker (same occupation listed in 1920 and 1930 census) in 1910. [S244] U.S. Federal Census 1910 U.S. Federal Census, by Ancestry.com, ED78. Dwelling 20. Henry Harry Smith was born circa 1896 at Oregon. He married Enid Glenda Leeper, daughter of Harvey Ellwood Leeper and Delilah Amos Crotchett, on 10 August 1926 at Corvallis, Benton, Oregon. Name Variation Louisa Jane Zebley was also known as Lou. Married Name circa 1878 As of circa 1878,her married name was Crotchett. Louisa Jane Zebley was born on 31 March 1859 at Illinois. She married John Owen Crotchett, son of Stephen Coe Crotchett and Polly Clark, circa 1878 at Girard, Kansas. Louisa Jane Zebley died in 1925 at Pittsburg, Crawford, Kansas. 1 March 1885 Baker, Crawford, Kansas Louisa Jane Zebley appeared on the census of 1 March 1885 in the household of John Owen Crotchett at Baker, Crawford, Kansas. 1 March 1895 Cherokee, Crawford, Kansas Louisa Jane Zebley appeared on the census of 1 March 1895 in the household of John Owen Crotchett at Cherokee, Crawford, Kansas. 1 March 1905 Baker, Crawford, Kansas Louisa Jane Zebley appeared on the census of 1 March 1905 in the household of John Owen Crotchett at Baker, Crawford, Kansas. Louisa Jane Zebley had 12 with 7 living in 1900 children. She had 13 with 6 living in 1910 children. Name Variation Emory Crotchett was also known as Emery. Emory Crotchett was born on 30 September 1880 at Kansas. He was the son of John Owen Crotchett and Louisa Jane Zebley. As of September 1918, Emory Crotchett was never married. 1 March 1885 Baker, Crawford, Kansas Emory Crotchett appeared on the census of 1 March 1885 in the household of John Owen Crotchett at Baker, Crawford, Kansas. 1 March 1895 Cherokee, Crawford, Kansas Emory Crotchett appeared on the census of 1 March 1895 in the household of John Owen Crotchett at Cherokee, Crawford, Kansas. 1 March 1905 Baker, Crawford, Kansas Emory Crotchett appeared on the census of 1 March 1905 in the household of John Owen Crotchett at Baker, Crawford, Kansas. On 12 September 1918 at World War I Draft Registration, Crawford, Kansas. Name Variation Celia M. Volmer was also known as Cecelia. Married Name 25 September 1917 As of 25 September 1917,her married name was Braunesreither. Celia M. Volmer was born on 31 July 1897 at Montrose, Henry, Missouri, also reported as Jul 1892. Celia M. Volmer married Albert G. Braunesreither, son of August Braunesreither and Maria Ann Juergens, on 25 September 1917 at Catholic Church, Lesterville, Yankton, South Dakota. Celia M. Volmer died on 24 March 1970 at Yankton, Yankton, South Dakota, at age 72. Oscar Torgerson was born on 7 October 1885 at Aten, Nebraska. He was the son of Tov Torgerson and Anna (?). Oscar Torgerson married Mary Volmer, daughter of Herman Volmer Sr. and Mary A. Hilgenhold, on 18 February 1909. Oscar Torgerson died on 27 February 1950 at Jones, South Dakota, at age 64. Tov Torgerson married Anna (?). Married Name Her married name was Torgerson. Anna (?) married Tov Torgerson. Hilda Torgerson was born in 1915. She was the daughter of Oscar Torgerson and Mary Volmer. Hilda Torgerson died in 1938 at Williams Creek, Jones, South Dakota. Mary C. Volmer was born circa 1918 at Missouri. She was the daughter of Joseph M. Volmer and Mary A. Beckebrock. Name Variation Frederick William Niemann was also known as F. W.
Name Variation Frederick William Niemann was also known as Fred William. Frederick William Niemann was born on 3 January 1888 at Loganville, Sauk, Wisconsin. He was the son of Henry Friedrich Niemann and Anna Margaretha Hasz. Frederick William Niemann married Johanna E. Kuethe, daughter of Rev. Friedrich Kuethe and Wilhelmina F. Grossman, before June 1917. Frederick William Niemann witnessed the marriage of August G. Baumgarten and Bertha A. Niemann in March 1918 at Iowa; Announcement is made of the recent marriage of Miss Bertha Niemann of Madison and A. G. Baumgarten of Loganville, which took place at the home of the bride's sister, Mrs. Carl Kuethe, Waverly, Iowa, Rev. Emil H. Rausch officiating. The couple was attended by the bride's brother and sister-in-law, Mr. and Mrs. Frederick Niemann. Mr. and Mrs. Baumgarten left on a trip to Florida and will be at home to their friends after the first of April in Loganville. (published in The Capital Times, Madison, WI, 09 Mar 1918). 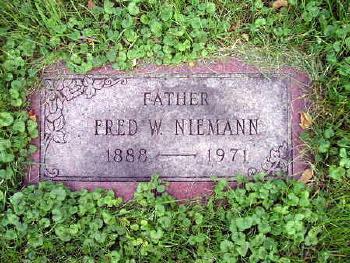 Frederick William Niemann died on 21 October 1971 at age 83. He was buried after 21 October 1971 at Harlington Cemetery, Waverly, Bremer, Iowa. 1 January 1925 Maxfield, Bremer, Iowa He appeared on the census of 1 January 1925 at Maxfield, Bremer, Iowa. On 5 June 1917 at World War I Draft Registration, Bremer, Iowa. [S245] U.S. Federal Census 1900 U.S. Federal Census, by Ancestry.com, ED149. Stamp 144. Dwelling 97. [S373] U.S. Federal Census 1940 U.S. Federal Census, by Ancestry.com, Year: 1940; Census Place: Le Roy, Bremer, Iowa; Roll: T627_1142; Page: 3B; Enumeration District: 9-13. Name Variation Maria Christena Milliron was also known as Christena. Name Variation Maria Christena Milliron was also known as Dinah Christine. Name Variation Maria Christena Milliron was also known as Diana. Married Name 26 January 1796 As of 26 January 1796,her married name was Pershing. Maria Christena Milliron was born on 30 January 1777 at Westmoreland, Pennsylvania, also reported as Indiana County, Pennsylvania; also reported as 1774. Maria Christena Milliron married Reverand Daniel Pershing, son of Frederick Pfoersching and Maria Elizabeth Weygandt, on 26 January 1796 at Coventry, Chester, Pennsylvania. Maria Christena Milliron died on 21 January 1863 at St. Clair, Westmoreland, Pennslyvania, at age 85. [S248] U.S. Federal Census 1860 U.S. Federal Census, by Ancestry.com, Page 117. Dwelling 892. Name Variation John David Milliron was also known as David. John David Milliron was born on 23 February 1778 at Westmoreland, Pennsylvania. He was the son of John Phillip Milliron and Maria Barbara Altman. John David Milliron married Barbara Cribbs, daughter of John Jacob Cribbs and Anna Haines, in 1803 at Pennsylvania. John David Milliron died on 23 December 1850 at Michigan at age 72. 1800 Wheatfield, Westmoreland, Pennsylvania John David Milliron was referenced on John Phillip Milliron's household in the 1800 Census at Wheatfield, Westmoreland, Pennsylvania; Free White Persons - Males - Under 10: 2; Free White Persons - Males -10 thru 15: 2; Free White Persons - Males - 16 thru 25: 1; Free White Persons - Males - 45 and over: 1; Free White Persons - Females - Under 10: 1; Free White Persons - Females - 26 thru 44: 1. [S249] U.S. Federal Census 1850 U.S. Federal Census, by Ancestry.com, Stamp 384. Dwelling 67. Married Name Her married name was Van Leer. Susannah Magdalena Milliron married (?) Van Leer. Susannah Magdalena Milliron was born on 22 April 1781 at Hempfield, Westmoreland, Pennsylvania. Abraham Milliron was born on 24 September 1785 at Hempfield, Westmoreland, Pennsylvania. Abraham Milliron married Mary Ann Shafer circa 1804. Abraham Milliron died on 10 February 1852 at Beaver Township, Jefferson, Pennsylvania, at age 66. 1800 Wheatfield, Westmoreland, Pennsylvania Abraham Milliron was referenced on John Phillip Milliron's household in the 1800 Census at Wheatfield, Westmoreland, Pennsylvania; Free White Persons - Males - Under 10: 2; Free White Persons - Males -10 thru 15: 2; Free White Persons - Males - 16 thru 25: 1; Free White Persons - Males - 45 and over: 1; Free White Persons - Females - Under 10: 1; Free White Persons - Females - 26 thru 44: 1. 1810 Fairfield, Westmoreland, Pennsylvania Abraham Milliron was listed as the head of a family on the 1810 Census at Fairfield, Westmoreland, Pennsylvania, Free White Persons - Males - Under 10: 2; Free White Persons - Males - 16 thru 25: 1; Free White Persons - Females - 16 thru 25: 1. Name Variation John Henry Milliron was also known as Henry. John Henry Milliron was born on 1 December 1787 at Westmoreland, Pennsylvania. John Henry Milliron married Rebecca Margaret Nulf, daughter of Henry Nulf and Sarah (? ), in 1813. John Henry Milliron married Anna Maria Altman, daughter of David Altman and Susanna Riegle, after 1824 at 2nd marriage for him. John Henry Milliron was buried in 1869 at Milliron Cemetery, Westmoreland, Pennsylvania. He died in 1869 at Westmoreland, Pennsylvania. 1800 Wheatfield, Westmoreland, Pennsylvania John Henry Milliron was referenced on John Phillip Milliron's household in the 1800 Census at Wheatfield, Westmoreland, Pennsylvania; Free White Persons - Males - Under 10: 2; Free White Persons - Males -10 thru 15: 2; Free White Persons - Males - 16 thru 25: 1; Free White Persons - Males - 45 and over: 1; Free White Persons - Females - Under 10: 1; Free White Persons - Females - 26 thru 44: 1. 1810 Fairfield, Westmoreland, Pennsylvania John Henry Milliron was referenced on John Phillip Milliron's household in the 1810 Census at Fairfield, Westmoreland, Pennsylvania; surname listed as Millirons; Free White Persons - Males - Under 10: 1; Free White Persons - Males - 10 thru 15: 2; Free White Persons - Males - 16 thru 25: 1; Free White Persons - Males - 45 and over: 1; Free White Persons - Females - 16 thru 25: 1; Free White Persons - Females - 45 and over: 1. Name Variation Anna Margaretta Milliron was also known as Margaret. Married Name circa 1815 As of circa 1815,her married name was Hice. Anna Margaretta Milliron was born on 22 January 1790 at Hempfield, Westmoreland, Pennsylvania. Anna Margaretta Milliron married John Henry Hice, son of William G. Hice and Polly Skiles, circa 1815 at Brushvalley, Indiana, Pennsylvania. Anna Margaretta Milliron died on 29 August 1850 at Michigan at age 60. 1800 Wheatfield, Westmoreland, Pennsylvania Anna Margaretta Milliron was referenced on John Phillip Milliron's household in the 1800 Census at Wheatfield, Westmoreland, Pennsylvania; Free White Persons - Males - Under 10: 2; Free White Persons - Males -10 thru 15: 2; Free White Persons - Males - 16 thru 25: 1; Free White Persons - Males - 45 and over: 1; Free White Persons - Females - Under 10: 1; Free White Persons - Females - 26 thru 44: 1. 1810 Fairfield, Westmoreland, Pennsylvania Anna Margaretta Milliron was referenced on John Phillip Milliron's household in the 1810 Census at Fairfield, Westmoreland, Pennsylvania; surname listed as Millirons; Free White Persons - Males - Under 10: 1; Free White Persons - Males - 10 thru 15: 2; Free White Persons - Males - 16 thru 25: 1; Free White Persons - Males - 45 and over: 1; Free White Persons - Females - 16 thru 25: 1; Free White Persons - Females - 45 and over: 1. Name Variation Johannes George Milliron was also known as John George. Johannes George Milliron was born on 29 October 1792 at Westmoreland, Pennsylvania. Johannes George Milliron married Mary Elizabeth Doverspike, daughter of Henry Doverspike and Elizabeth Charles, circa 1810. Johannes George Milliron died after 20 April 1865 at Armstrong, Pennsylvania. 1800 Wheatfield, Westmoreland, Pennsylvania Johannes George Milliron was referenced on John Phillip Milliron's household in the 1800 Census at Wheatfield, Westmoreland, Pennsylvania; Free White Persons - Males - Under 10: 2; Free White Persons - Males -10 thru 15: 2; Free White Persons - Males - 16 thru 25: 1; Free White Persons - Males - 45 and over: 1; Free White Persons - Females - Under 10: 1; Free White Persons - Females - 26 thru 44: 1. 1810 Fairfield, Westmoreland, Pennsylvania Johannes George Milliron was referenced on John Phillip Milliron's household in the 1810 Census at Fairfield, Westmoreland, Pennsylvania; surname listed as Millirons; Free White Persons - Males - Under 10: 1; Free White Persons - Males - 10 thru 15: 2; Free White Persons - Males - 16 thru 25: 1; Free White Persons - Males - 45 and over: 1; Free White Persons - Females - 16 thru 25: 1; Free White Persons - Females - 45 and over: 1. [S249] U.S. Federal Census 1850 U.S. Federal Census, by Ancestry.com, Dwelling 67. Name Variation John Wilhelm Milliron was also known as William. John Wilhelm Milliron was born on 5 June 1795 at Westmoreland, Pennsylvania. John Wilhelm Milliron married Elizabeth (?) circa 1820. John Wilhelm Milliron died on 20 April 1865 at Armstrong, Pennsylvania, at age 69. 1800 Wheatfield, Westmoreland, Pennsylvania John Wilhelm Milliron was referenced on John Phillip Milliron's household in the 1800 Census at Wheatfield, Westmoreland, Pennsylvania; Free White Persons - Males - Under 10: 2; Free White Persons - Males -10 thru 15: 2; Free White Persons - Males - 16 thru 25: 1; Free White Persons - Males - 45 and over: 1; Free White Persons - Females - Under 10: 1; Free White Persons - Females - 26 thru 44: 1. 1810 Fairfield, Westmoreland, Pennsylvania John Wilhelm Milliron was referenced on John Phillip Milliron's household in the 1810 Census at Fairfield, Westmoreland, Pennsylvania; surname listed as Millirons; Free White Persons - Males - Under 10: 1; Free White Persons - Males - 10 thru 15: 2; Free White Persons - Males - 16 thru 25: 1; Free White Persons - Males - 45 and over: 1; Free White Persons - Females - 16 thru 25: 1; Free White Persons - Females - 45 and over: 1. Total Free White Persons: 7. Name Variation John Peter Milliron was also known as Peter. John Peter Milliron was born on 30 June 1799 at Westmoreland, Pennsylvania. John Peter Milliron married Margaret Hice, daughter of George Hice and Mary Ann MacDonald, between 1825 and 1828. John Peter Milliron died after 1850 at Westmoreland, Pennsylvania. [S249] U.S. Federal Census 1850 U.S. Federal Census, by Ancestry.com, Written number 236. Dwelling 209. Catherine Milliron was born circa 1800 at Westmoreland, Pennslyvania.